Havina is a Finnish word for the small swish, sound of leaves. This earthy colored handdyed yarn inspired into vernal, generously sized shawl design, featuring Stockinette and light ribbing ending up in leaf pattern with simple garter twist. 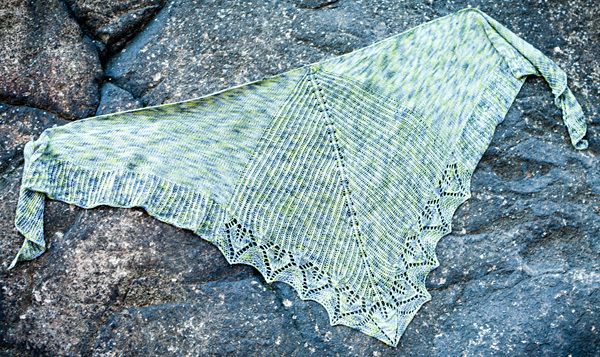 This slightly crescent shaped, triangle shawl, is constructed from top down and shaped with increases on edges and in the middle. 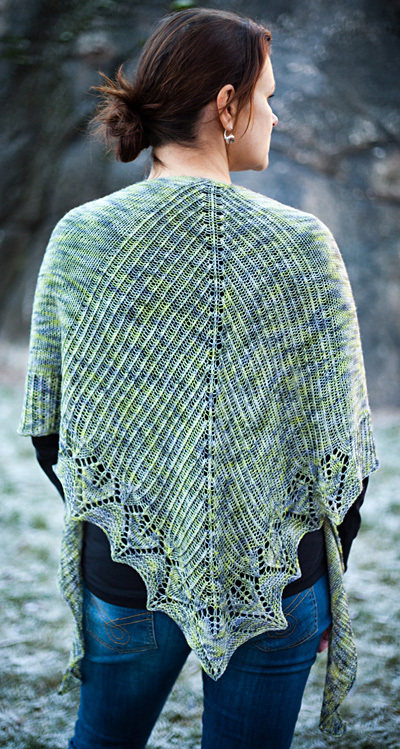 Lacy feeling on the middle wedge is achieved by working the knit stitches from the back loop. 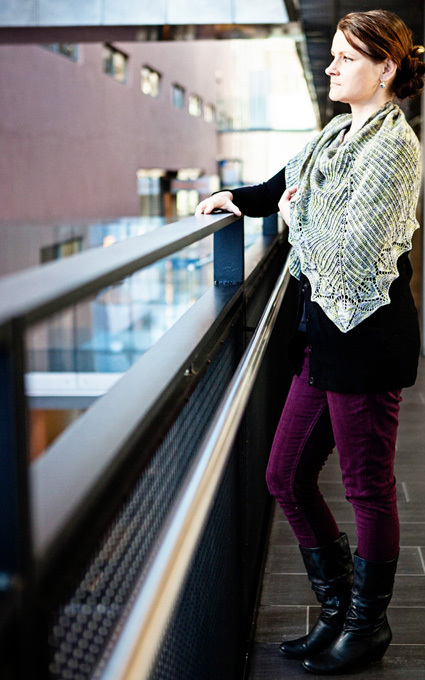 With different color choice or different yarn, the shawl is either casual or festive. At the end of the 6th row, do not turn work. Pick up and knit 3 sts along the long edge of your work, turn work, and pick up and knit another 2 sts along the CO edge. 7 sts. Row 1 [WS]: K2, p3, k2. Row 2 [RS]: K2, yo, k1, yo, k1 tbl, yo, k1, yo, k2. 11 sts. Row 3 [WS]: K2, yo, p2, k1, p1 tbl, k1, p2, yo, k2. 13 sts. Row 4 [RS]: K2, yo, k2, M1R, place marker 1, k1, M1R, p1, place marker 2, k1 tbl, place marker 3, p1, M1L, k1, place marker 4, M1L, k2, yo, k2. 19 sts. Note: Markers 2 and 3 are used to denote central spine; markers 1 and 4 are used to designate the patterned areas. Row 5 [WS]: K2, yo, p to first marker (marker 4), [k1, p1 tbl] to 1 st before last marker (marker 1), k1, p to last 2 sts, yo, k2. 21 sts. Row 6 [RS]: K2, yo, k to marker 1, [p1, k1 tbl] to 1 st before marker 4, p1, k to last 2 sts, yo, k2. 23 sts. Row 7 [WS]: As Row 5. 25 sts. Row 8 [RS]: K2, yo, k to marker 1, p1, k1 tbl, (k1, yo, k1) in the next stitch, k1 tbl, (k1, yo, k1) in the next stitch, k1 tbl, p1, k to last 2 sts, yo, k2. 31 sts. Row 9 [WS]: As Row 5. 33 sts. Row 10 [RS]: K2, yo, k to marker 1, [p1, k1 tbl] to one st before marker 4, p1, k to last 2 sts, yo, k2. 2 sts increased. Row 11 [WS]: K2, yo, p to marker 4, [k1, p1 tbl] to one st before marker 1, k1, p to last 2 sts, yo, k2. 2 sts increased. 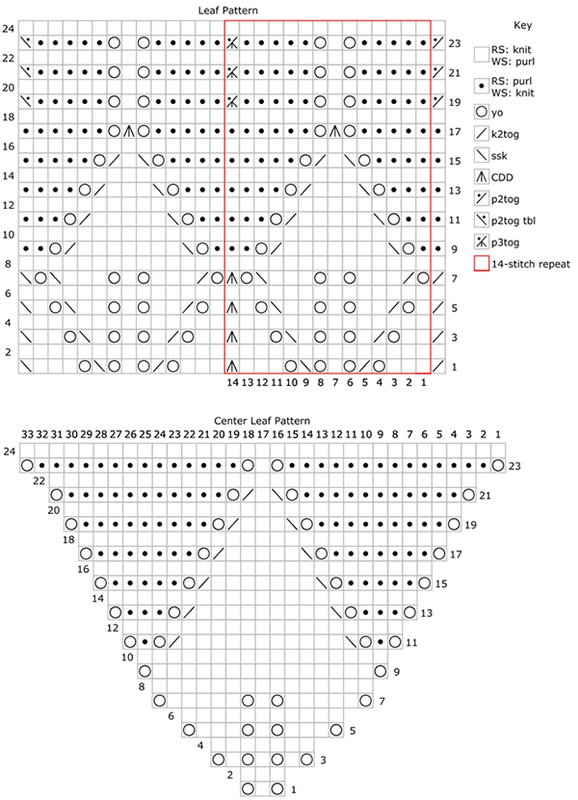 Row 12 [RS]: K2, yo, k to marker 1, [p1, k1 tbl] to one st before marker 2, (k1, yo, k1) in the next stitch, k1 tbl, (k1, yo, k1) in the next stitch, [k1 tbl, p1] to marker 4, k to last 2 sts, yo, k2. 6 sts increased. Row 13 [WS]: As Row 11. 2 sts increased. Repeat Rows 10-13 25 times more, and then Rows 10-11 once more. 349 sts. Row 1 [RS]: K2, yo, purl to marker 1, work Leaf Pattern to marker 2, work Center Leaf Pattern to marker 3, work Leaf Pattern to marker 4, purl to last 2 sts, yo, k2. Row 2 [WS]: K2, yo, [k1, p1 tbl] to marker 4, work Leaf Pattern to marker 3, work Center Leaf Pattern to marker 2, work Leaf Pattern to marker 1, [p1 tbl, k1] to last 2 sts, yo, k2. Row 3 [RS]: K2, yo, [k1 tbl, p1] to one st before marker 1, k1 tbl, work Leaf Pattern to marker 2, work Center Leaf Pattern to marker 3, work Leaf Pattern to marker 4, [k1 tbl, p1] to last 3 sts, k1 tbl, yo, k2. Row 4 [WS]: As Row 2. Repeat Rows 3-4 until all 24 rows of the leaf pattern are complete. BO loosely as follows: K1, *k1, slip 2 sts back to the left needle, k2tog tbl; rep from * until 1 st rems. Cut yarn and pull through final st to secure. Wet block and weave all yarn ends. 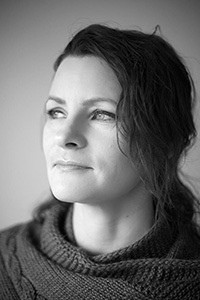 Meiju K-P is a mother of three boys and works as a researcher and social scientist in Helsinki, Finland. Her knitting hobby grew into knitwear designing and she has patterns available for download on Ravelry.